Freckles in April: Knee Length Shorts! I'm dipping into the waters of shorter-than-knee-length shorts (woot!) but I know like 95% of my readership is always on the lookout for longer shorts. Here are a few I've found lately while shopping around! 1. Nordstrom | Comes in 5 different colors! 2. Nordstrom | A nice darker wash and I love the thick hem. 3. Macy's | On sale! Only a few sizes left though- be speedy! 4. Land's End | LOVE the color options. Pink! Turquoise! Navy! 5. JCPenney | Can't go wrong with a little distressed detail in the summertime. 6. Gap | TONS of great options from Gap. Love this casual, light wash option but it comes in several other washes. 7. Gap | Love the slouchiness. How great would these be with a slim fit tee or a tank at the beach? 8. Macy's | Not sure if these even qualify as shorts? They're like...pedal pushers? If those are still a thing. But lots of fun color options. 9. Macy's | LEMON PRINT. Also, sale. 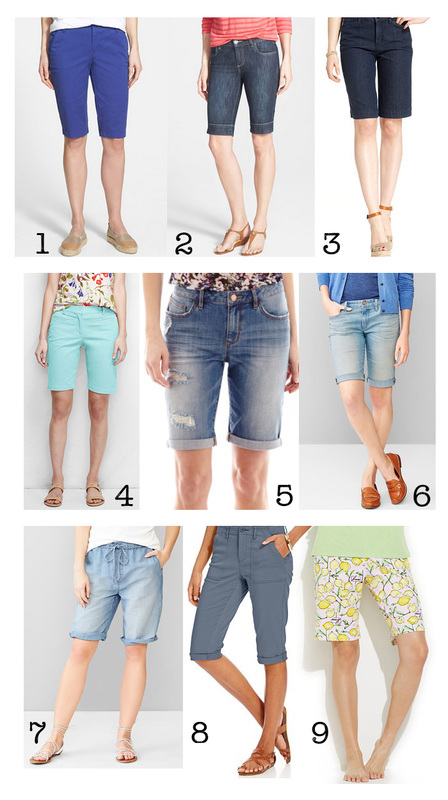 Where are your favorite places for knee-length shorts? hmm....this is a great round-up. now, if only my wish could come true and you could round up some that aren't so short, my "had two babies- fat" legs show way too much, but yet aren't so long that i sweat and die in knee lengths. the in-between is so so tricky, and i'm shorter too, so there is that whole cutting the leg in half deal too! ugh. summer time clothes give me a run for my money. Nice round up! Shorts shopping is always a struggle! I used to wear short shorts, then I went to bermuda shorts, and now I'm trying to find The Perfect Pair that's somewhere in between without going too mom. Sigh. I still like knee-length shorts in some of their varieties, but shorter shorts are so much more "me" feeling when I wear them. I have this super grunge pair that are crazy short and they are my favorite.